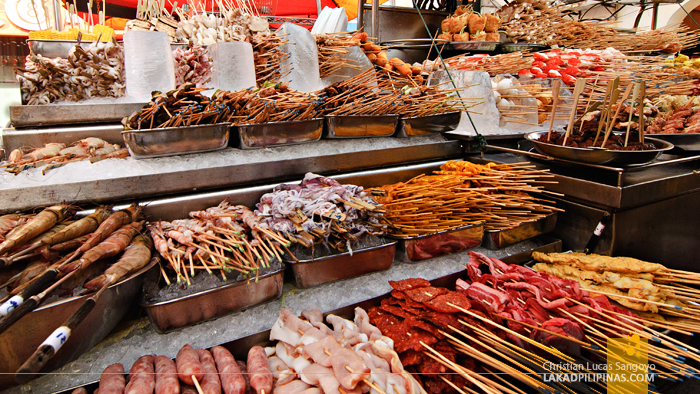 Everything skewered I can think of was probably skewered on a stick at one of the stalls we stopped by at the Chinatown area of Kuala Lumpur. Squids, sausages, prawns, chicken bits, hotdogs, squid balls, shrimp balls, tofu cubes, octopus, corns, mushrooms, heck they even have eggplants and broccolis! It was such an overwhelming sight that we were unable to pick even one stick to barbecue. 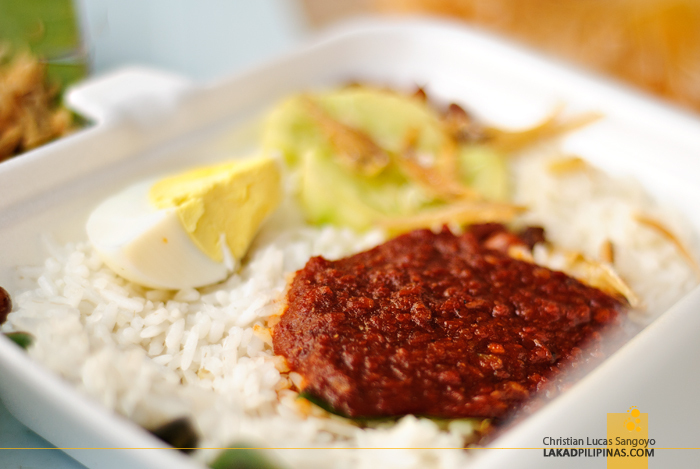 After landing at Kuala Lumpur for a connecting flight to Siem Reap, food was the first order of the day. 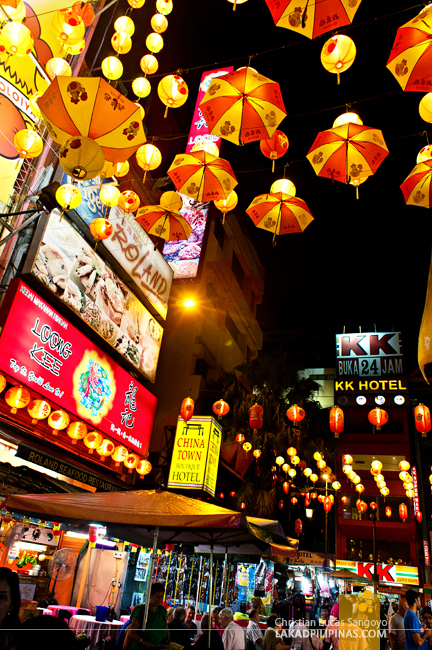 Once our bags were laid down and we got to freshen up a bit at Ceria Hotel in Bukit Bintang, we immediately headed to KL’s Chinatown, which we thought to be a good place as any to check the local street food scene. On our way there, we passed a street food alley near McDonald’s and Starbucks near Chinatown where we got our first taste of what KL has to offer when it comes to cheap street fare. We were not quite sure what the fried goodies we ordered were, we just pointed and they gave. My favorite among the bunch was the deep-fried tofu thing with bean sprouts and all sorts of veggies inside. 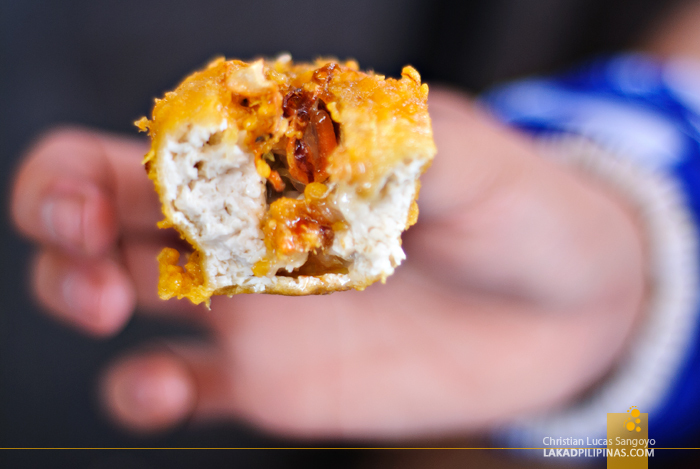 The locals call it taufu sumbat or stuffed tau fu. It was freakin’ delicious that we ordered a few more before going our merry way. A quick smile from a lady manning a stall named Kopi Jantan had us drawn. We quickly looked for something familiar, rice. This was our introduction to nasi goreng (4.00 MYR, about Php 50.00), which basically means fried (goreng) rice (nasi). The whole thing was served on banana leaf and was infused with chicken bits, fried egg, shallots and chili. 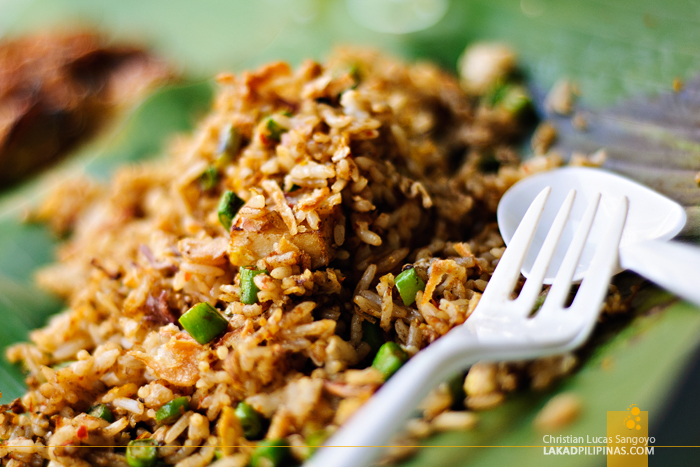 The rice is then spiced with sweet soy sauce which they refer to as kecap manis. It. Was. Spicy. As. Hell. From another stall, we scored a bunch of chicken satay (.80 MYR per piece). 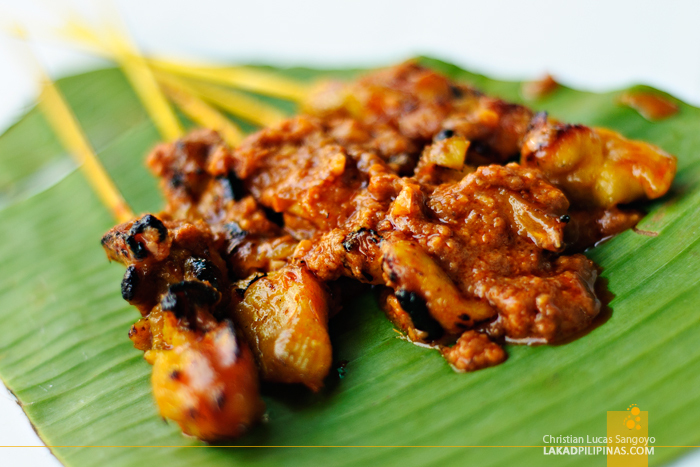 It’s basically marinated barbecued chicken that comes with peanut sauce as dip. It made such a good pair with the spicy fried rice that we ended up ordering a few more sticks, which fortunately is okay with the stall we bought our nasi goreng from. 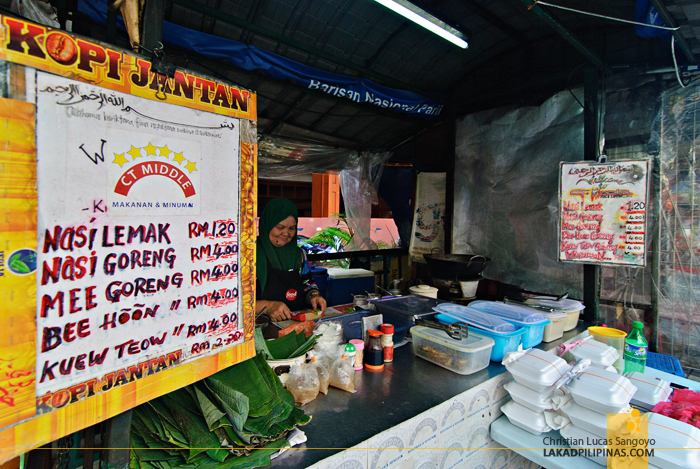 Still not satiated, my partner in crime asked for a plate of nasi lemak (1.50 MYR), a traditional Malaysian breakfast fare of steamed rice cooked in coconut milk, anchovies, hard-boiled egg, topped with shrimp paste, cucumbers and peanuts, before running to another stall to claim a bag of roti canai (1.50 MYR). 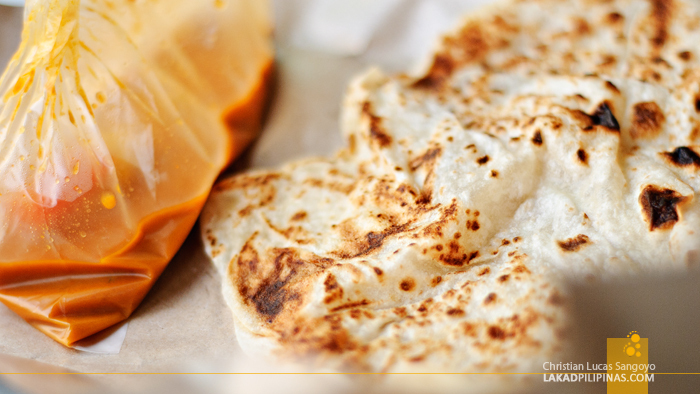 It’s a type of soft flatbread made from flour and is usually paired with curry where you dip it into. I love the latter, the former was so so. 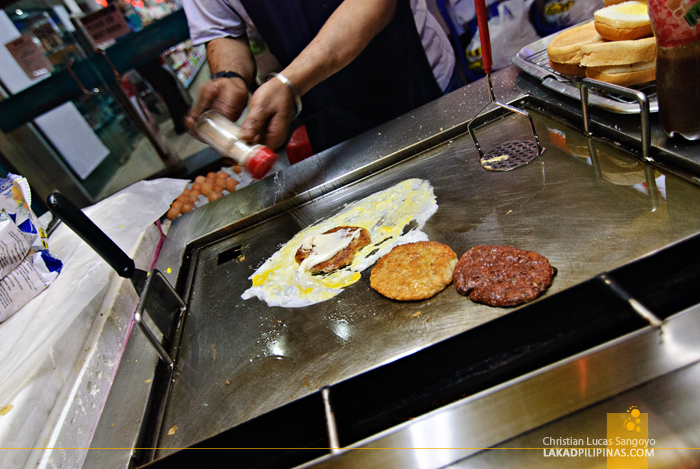 Later that night after gaping in awe of the Petronas Towers, we chanced upon a burger stand right at the corner of Chinatown; KL’s famous Ramly Burger. 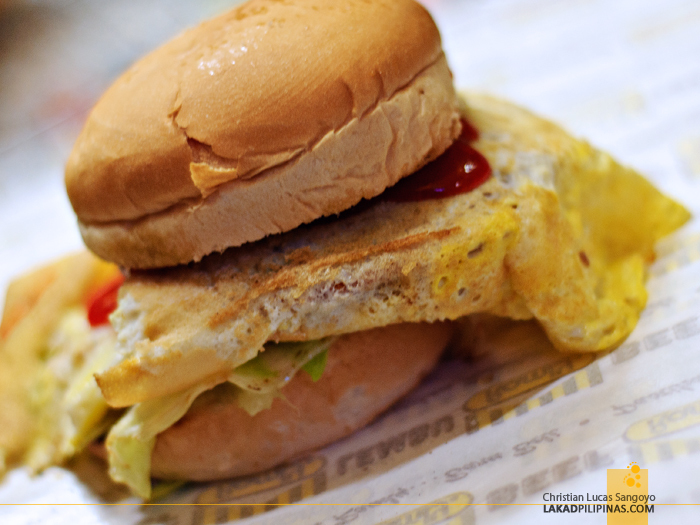 I guess it’s similar to our very own Angel’s Burger, the difference being that they don’t skimp on the ingredients, the burger patties and bread were a mouthful. We ordered a couple of their Burger Ayam Special (5.00 MYR), which is basically a chicken patty wrapped in fried egg, lathered with ketchup and topped with some veggies. It looked like one big messy delight, so we were quite disappointed upon first bite; it tasted quite ordinary. No doubt, I’ll have my Jollibee Yum over this one anytime. After a few weeks of being away, we soon flew back to Kuala Lumpur for another connecting flight to Penang. 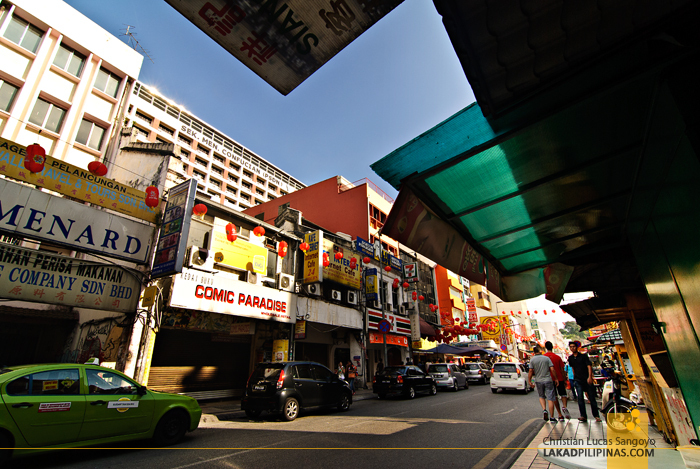 After we walked all the way to the KL Tower from the Apple Hotel in Jalan Alor, we again revisited Chinatown, looking for something to appease the dragons in our tummies. 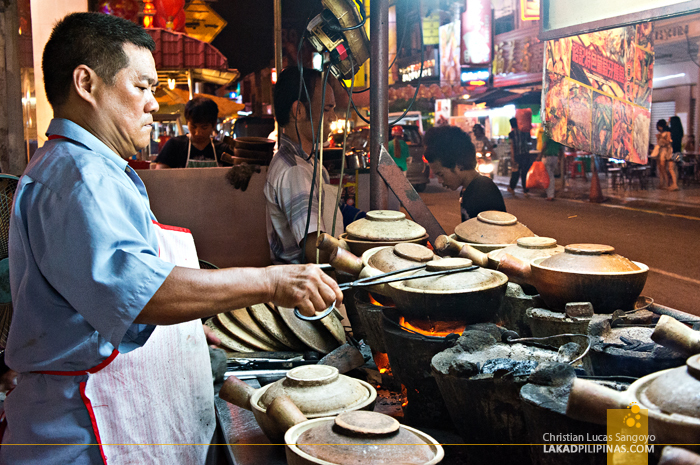 What we had in mind was the Hong Kee claypot stall we saw during our previous visit. We were quite full the last time, so this was our chance to finally try it. From the street, we can already see a dozen of clay pots sitting on traditional charcoal stove similar to our kalan in the province. 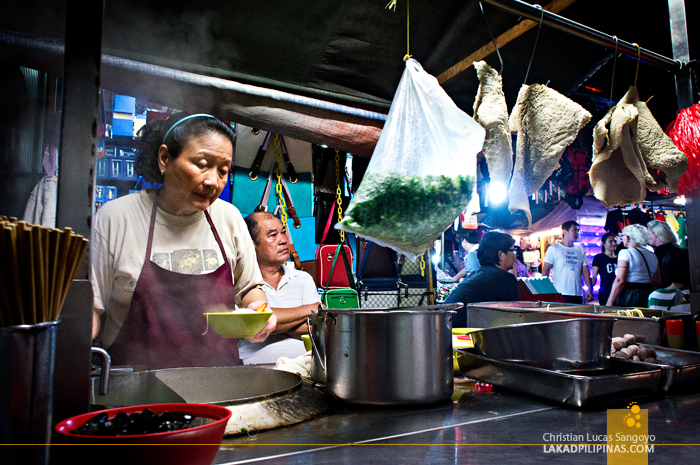 Since Malaysia is generally a Muslim country, most of the dishes have no pork in them, the only choice really was chicken or beef. We asked for their clay pot chicken rice (10 MYR), which is quite pricey for us. We however found that it was good enough for two, so we went ahead and ordered a pot. 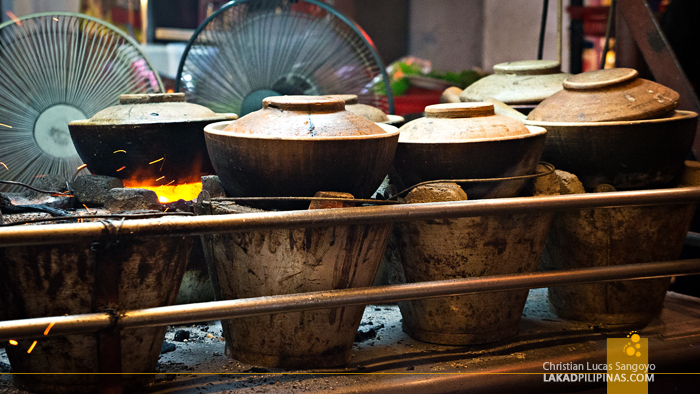 The chicken rice is served right along with hot pot which keeps the food steaming the whole time. 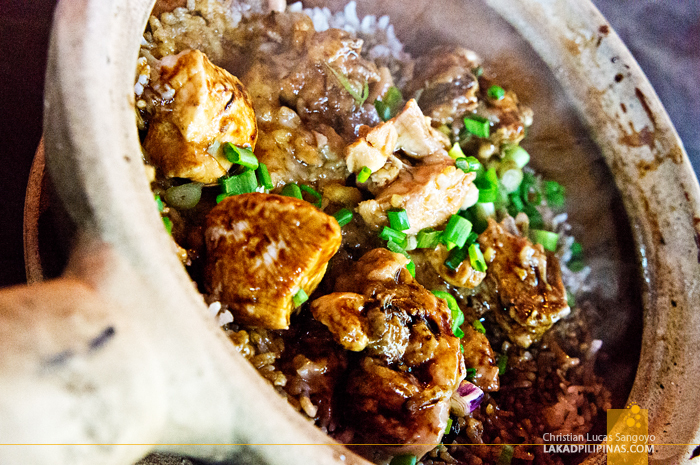 It is comprised of steamed rice dressed with soy sauce, sesame oil, lard and topped with scallions. They say the best part of this dish is the rice crust at the bottom of the pot. Taste was just okay for me but my travel buddy was quite enticed by it. The only downside in having this kind of meal is its cooking time. Since it is slow-cooked, it takes about five to ten minutes of waiting before you can chow down. With space left in our tummies for one more dish, we scoured the side streets of Chinatown and found a small unnamed stall selling noodles near Jalan Petaling. The store’s name simply said Beef Noodles so I guess they sell nothing but those. We sat down at the alley parallel to it and ordered a serving. 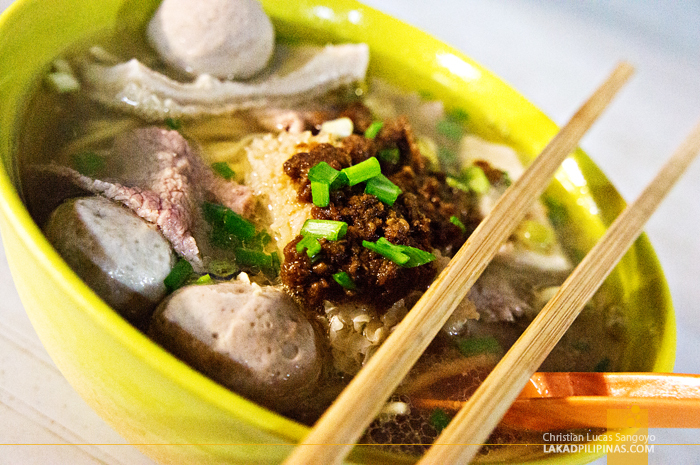 A steaming bowl of noodles (7.00 MYR) filled with all sorts of meat was soon plunked down our table. I have absolutely no idea what they were aside from the slices of beef meat and tripe (what we commonly refer to as tuwalya). The whole thing looked quite delicious but I found it wanting a bit on flavor. A few shake of pepper and what-nots proved to be the solution. We like our food in pairs. 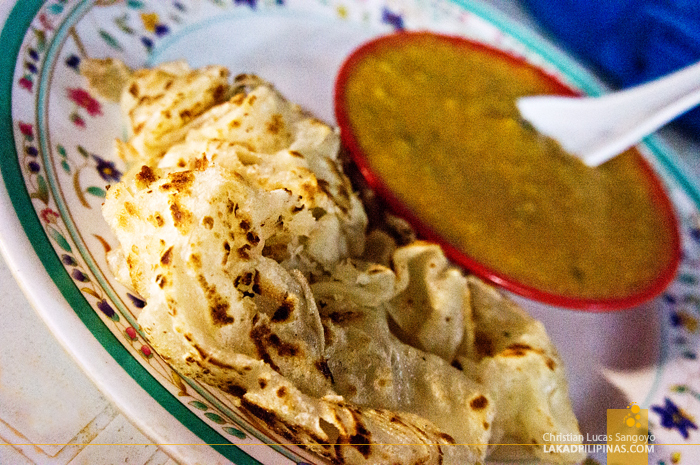 So to pair the noodles, we found another stall selling roti cania (1.50 MYR), my foodie partner’s favorite street food. Unlike the first one we tried near the mouth of Chinatown, it was a bit of a disappointment. I found the dip a little too bland for my taste and so does she. Good thing it matches well with our beef noodles. 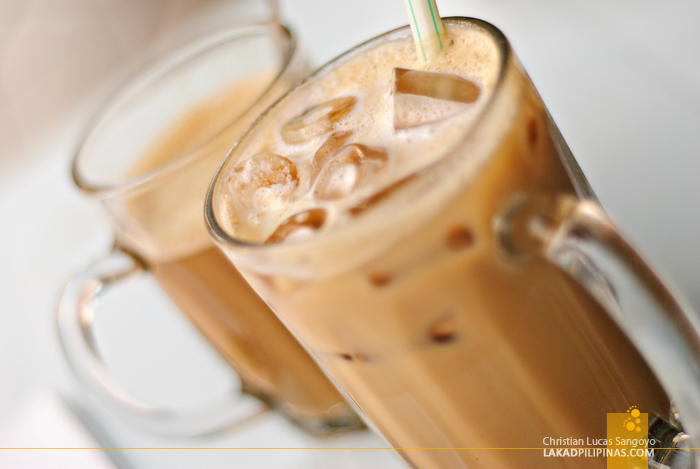 And with all those dishes, there is nothing more perfect than to finish them off with Malaysia’s kopi ice, which is as you have probably guessed, is simply iced coffee. I love, love, love kopi ice. It’s basically dark coffee infused with condensed milk and lots and lots of ice. It’s everywhere in Malaysia and cost only 2.00 Ringgits. A Malaysian acquaintance once asked me what kind of refreshment we have in the Philippines and she was absolutely shocked that we don’t have iced coffee available right on the street. Well, I told her that we have them, but they’re in Starbucks and they’re expensive.